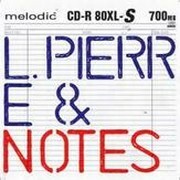 L Pierre is, for those who don't already know, Arab Strap's Aidan Moffat. As L Pierre he gives himself over to the world of samples, loops, and on the opening track I Hate T-Shirts That Say 1977, large helpings of funk. With a little help from a brilliantly executed classical loop and some acerbic yet almost apathetic rhyming from American rapper Notes, I Hate T-Shirts... sets its stall out as a dirty funk beast with delusions of grandeur. It is of course quite brilliant. Biblebash! changes tack immediately. The funk has disappeared, only to be replaced by something that could easily be a soundtrack to the Final Fantasy video games as written by Gary Numan. This is not necessarily a bad thing.